This post really is a long time coming, as I went to this festival at Portsmouth Historic Docks right at the end of November (the festival ran from 29 Nov - 1 Dec). 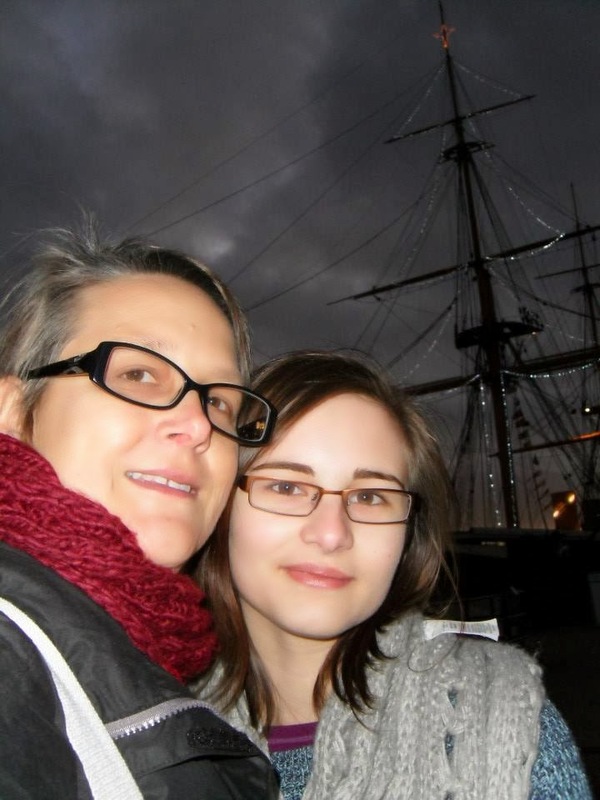 I went with my Mum and we stayed in a Holiday Inn a little walk away from the dockyard. The festival is run annually, and the website claims it is one of the biggest Christmas markets on the South coast. We went for the atmosphere, the exhibitions (all usual attractions - The Mary Rose, HMS Victory etc. are open as usual, and included in the tickets for the festival) and a little bit of Christmas shopping. When we got to the dockyard on the Saturday morning, we were greeted with lots of people dressed as Victorian characters, a choir which seemed to consist of workhouse children and fake snow! We wandered through the dockyard and made our way to the Mary Rose exhibition, which I had not been to since its renovation. It was really interesting to see everything that has been discovered from the ship's wreckage, and everything on display is an original artefact. I loved seeing this bit of salvaged knitting, you can still make out every stitch that survived. We spent the day with my Mum's sister and her family which was lovely as I've only met my Mum's sister twice before, and had never met her daughter and granddaughter. Throughout the day we looked at various different stalls which were all lovely but there were a lot of people so it was difficult to get close enough to the stalls to see things properly. Mum and I spent the day chasing clues, which were all to do with Sherlock Holmes. There were also actors dressed as Holmes and Watson, who were on stilts so you could spot them from a distance. We attended a Victorian lesson, teaching the three Rs with Miss Bumberry. The experience was designed more for children, and judging by the reactions around us many seemed to love the experience. We ended the day watching a procession of Victorian characters. It was a lovely day, but I won't be hurrying back. I enjoyed going, but it feels like something that I have done now, and don't really need to go again. That being said, it is a great place to spend time with people, so if invited to go with others I would go again.